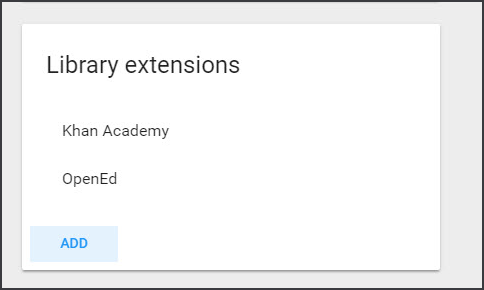 Echo comes with Khan Academy and OpenEd content already integrated in the Digital Library; you can deactivate these extensions easily. You can also make content from various other online resources available in the Digital Library. These can include other courses within your district or organization as well as open sources like EdGate, OpenEd, and Kahn Academy. Open Domain tool and from the vertical menu click on Domain Settings. 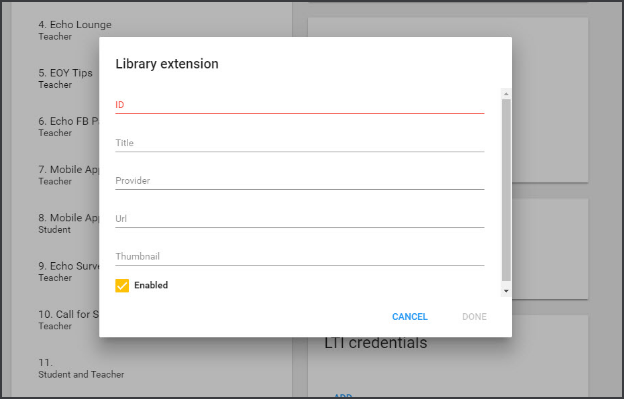 Enter ID name of the extension or an id if the provider is specified (required). Enter Title of this extension (Equella allows multiple instances) (optional). Enter Provider name. Use when you have multiple extensions of the same type (optional). Enter URL for the extension (required). Enter Thumbnail URL pointing to the image you want to use as the extension's thumbnail (optional). Click the Enabled box to show in the Digital Library. Select an existing integration to edit, disable, or remove it. How do I integrate Turnitin (and other LTIs) with Echo?